BEST-EVER Peanut Brittle – crispy, crunchy, loaded with peanuts. 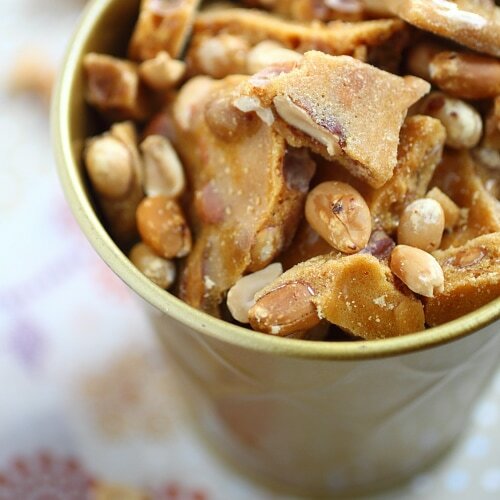 This amazing peanut brittle is a must-have for holidays! My friend Brian is the sweetest guy on earth. I “met” Brian a couple of years ago via Twitter and finally we met in person this October when his family came to visit. He is my biggest fan and supporter and he is always there for me whenever I need to chat or vent. Last December, Brian sent me a care package—a ziploc bag full of peanut brittle. At the first bite, I was immediately hooked. It was the BEST peanut brittle ever! This is not an over statement because I am not much a sweet tooth and I actually don’t like sweet stuff, but it was so good that I couldn’t stop munching away. This year, I waited anxiously for the holiday season, and without fail, my care package of peanut brittle arrived again and it was gone in no time…and I realized that I have to get Brian to share the recipe. Brian’s recipe came from his mom. They are crunchy, sweet, aromatic, with loads of peanuts and sinfully decadent and addictive. Thanks to Brian for sharing his peanut brittle recipe, and now more people can enjoy this wonderful sweet treat. If you are on Twitter, please follow Brian at @blew1. BEST-EVER Peanut Brittle - crispy, crunchy, loaded with peanuts. This amazing peanut brittle is a must-have for holidays. Attach the candy thermometer to the pot and combine the sugar, Karo and water. Heat the sugar, karo and water in the sauce pan until it reaches 236 degrees F on the thermometer. Stirring occasionally with wooden spoon. When it reaches 236 degrees add in the peanuts and cook until it reaches 294 degrees F on the thermometer. You should continue to stir frequently. You have to keep stirring, the candy will start to puff up. After all the candy is incorporated, you will need to quickly pour it into the greased sheet pan and spread it out evenly. Let it cool completely and then break it in pieces. If you want to make a lot you will have to restart the recipe over. Doubling up the recipe and the candy will not come out right. This looks good. I love peanut brittle for the holidays. What is karo syrup and where can I get them? Also spanish peanuts? Can I use regular peanuts? Karo syrup is a light corn syrup you can buy here at any supermarket. It is not High Fructose corn syrup. If you cannot get the Karo brand any light corn syrup will do. I like to use the Spanish peanuts because they have still the red skin(husk) still on. A regular peanut can be substitute but the skin does make a difference.Just make sure they are raw. wow, this does look good. I believe this would be most suitable for CNY too… contemplating now. Yes, it will be perfect. It’s better than the Chinese version of peanut brittle! Delicious! I’m not really a big fan of peanuts but I wanna try these!!!! can show us how to do it without using the candy thermometer? what is white karo syrup? what can we use to substitute it? This looks gorgeous and I’d love to make it but we don’t seem to get corn syrup in the UK. It would be useful to know the approximate dimensions of the sheet pan that should be used. For light corn syrup in the UK use Golden syrup. For dark corn syrup use Treacle. Brian’s peanut brittle looks tempting but baking is not my forte so I’ll just drool over your photo Bee. There’s no baking involved…just measuring, boiling and stirring. Rasa or Brian…when should the baking soda and salt be added? Looks like an easy and great candy for the holidays! Thanks for sharing Brian! Yes you should use the golden syrup!. The sheet pan I used was this one. Any standard size is good.. 12×16 13×18.. It can’t be too small or you will need a second pan. It should be greased up with butter real well. Thanks for sharing. Sure like to try but i do not have the thermometer. No need to bake the raw spanish peanuts or any of the nuts first?? so i can use golden syrup instead of karo syrup? It wasn’t too sweet but yet addictive. This recipe looks great too…might just give it a try. Thanks for sharing! My hubby’s favorite to have during the holidays… I wonder if I could substitute with pecans? LOVE PEANUT BRITTLE SO WIN ME. I love peanut brittle too…haven’t had some in a long time though. Wow! This was so good!!!! My only experience with peanut brittle is having it once from See’s candy. This recipe blows See’s out of the water! Thanks for sharing!! Thanks Karen, yes they are too good!! I’ve made this recipe 3 times now. First time with canned, roasted Spanish peanuts; it was crunchy and delicious. Second time used raw Spanish peanuts, as the recipe calls for; overall flavor was lacking and consistency was more chewey than crunchy. Third time, used canned, Spanish peanuts again; outcome is perfect. Not sure why raw peanuts are suggested. If. You eat one out of the bag, it’s clear it is softer with little crunch.